What is it about Easter that makes everyone go crazy for carrot cake? Is it simply because Easter is usually associated with bunnies and bunnies eat carrots? We, humans, are so weird. Whatever the reasoning behind it, I definitely can’t complain. I don’t know if it’s the fact that you’re eating something with vegetables in it that tastes so naughty or if it’s the cream cheese that is always paired with it, but I love carrot cake and will take any excuse I can get to enjoy it. I know some of you will probably take one look at this recipe and stick up your nose and judge me for using a box cake mix and to you I say BOO! Take your snobbiness elsewhere. And if you’re like me and can appreciate the ease and convenience of a box cake mix, then you’re going to love these babies. Preheat oven to 350ºF and grease a 9×13 inch baking pan. Bake for 11-13 minutes or until an inserted toothpick comes out clean. Let cool completely. Meanwhile, beat the cream cheese until it’s nice and smooth. Add the butter and mix until fully combined. Next add the powdered sugar, one cup at a time, until the frosting is nice and smooth. Spread the frosting evenly over the cooled cookie bars and enjoy. I want to make these asap! They are beautiful! Happy Easter! I love the way you frosted these. 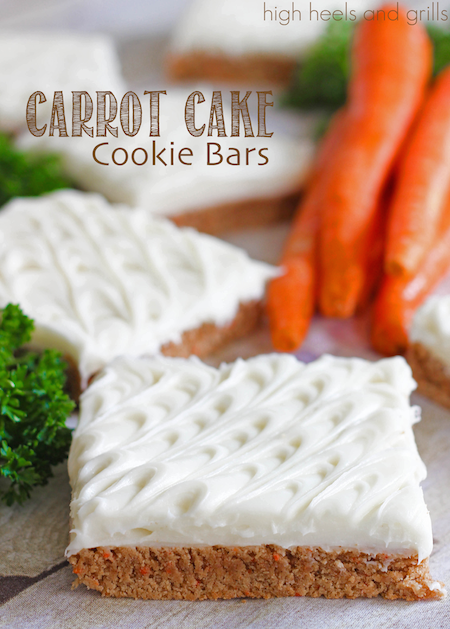 I love the flavor of carrot cake but don’t always like worrying about serving cake. This looks like the perfect answer. They sound so yummy and look so pretty with the little icing swooshing (that’s a very technical term, haha). Thanks for the idea! 🙂 Sharing on social media!